Plasma applet which allows quick access to tablet settings. Background daemon that automatically applies tablet settings when session starts or a tablet is plugged in, and provides global hotkeys for switching tablet configuration profiles. Tablet device recognition currently relies on internal database. 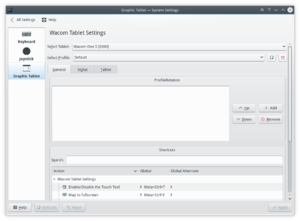 If your tablet is missing from System Settings, but is recognized by xsetwacom utility, run Wacom Tablet finder utility (kde_wacom_tabletfinder) and add your tablet manually. Wayland is not supported yet. This page was last modified on 3 April 2018, at 15:41. Content is available under Creative Commons License SA 4.0 unless otherwise noted.